One gear, no brakes… that’s a short introduction into Cycle Speedway racing! Sounds good doesn’t it! We caught up with Myke Grimes from the Coventry Cycle Speedway Club after his recent selection for England, to tell us all about it. Cycle speedway is a sport using push bikes with one gear and no brakes. With 4 riders in a race, they must complete 4 laps round a short oval track from a standing start and be the first one over the line to win. It can be either a team sport or individual and is basically like a cycling version of motorcycle speedway. There are lots of thrills and spills as it is a contact sport. It is described by some as Rugby on wheels. 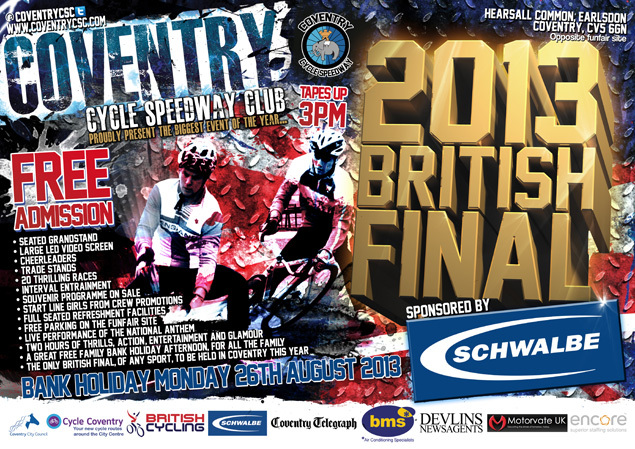 Where can people watch the Coventry Cycle Speedway Club races? Coventry CSC race at Hearsall Common opposite the funfair site, mostly on Sundays from 2pm. Visit www.coventrycsc.com for the full fixture list. Can anyone get involved? How can they do so? Anyone is welcome and encouraged to come and give the sport a go. We train on Wednesday nights at Hearsall Common. Training starts at 6:30pm and last between 90mins and 2 hours. Potential riders are advised to come ready to race with helmet, gloves and appropriate clothing (jogging bottoms/jumpers) as arms and legs must be covered at all times when racing. We provide the bikes! We have experienced riders Dave Frith and Norman Venson running the sessions as well as myself. How did you get into cycle speedway? My dad used to ride in the 60s and 70s. Naturally I fancied a go when I was a teenager before leaving the sport at 18 for 8 years. Then 2 years ago I wanted another crack at it and I haven’t looked back since! You have recently represented England, how did it feel to get the opportunity to do so? Racing for England was a fantastic opportunity. It’s not every day you get to wear the colours of your nation so it meant a lot to me to be selected. Especially with all the talented English riders there are out there. It was a great experience. What does the future hold for yourself and Cycle Speedway? First things first I need to make sure I qualify for the British Final on August Bank Holiday, which is at my home track at Hearsall Common. After that I plan to train and race as hard as I can, as well as helping to bring on the youngsters on Wednesday nights alongside the other session leaders Dave and Norman. Don’t miss the 2013 British Final at Hearsall Common! It’s on Bank Holiday Monday 26th August. It promises to be an entertaining afternoon, where 16 of the best British riders battle it out on track to be number one. Hopefully myself included!